A buckle is a clasp that attaches at one end of a strap allowing the other end to pass back through in order to secure clothing, shoes and other objects. Throughout the nineteenth century, cinched waistlines requiring wide cloth belts utilized oversized and highly elaborate buckles. So universal was the need for buckles that they were mass produced in almost every metal including cut steel. Buckles were also a very important accessoire on the shoes of well-dressed gentlemen in the eighteenth century. 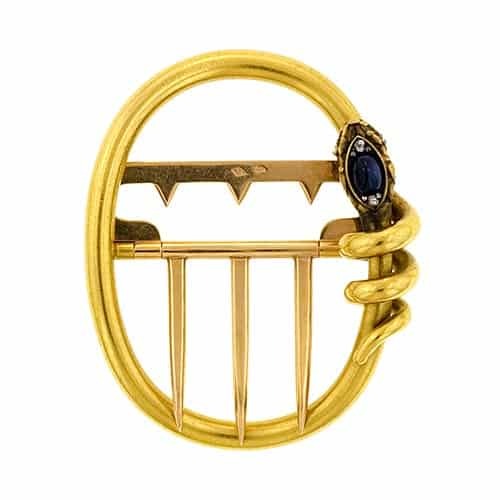 Brooches and rings employed buckles as decorative motifs and buckles served as functional closing mechanisms on bracelets and necklaces, particularly popular during the Victorian era. Expensive buckles were made from precious metals like gold and silver and could be gem-set or enameled.